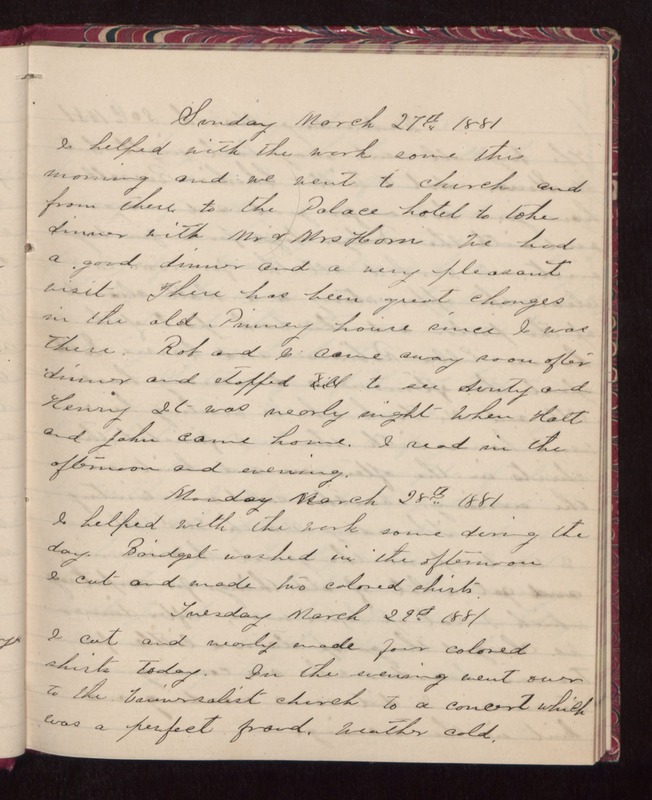 Sunday March 27th 1881 I helped with the work some this morning and we went to church and from there to the Palace hotel to take dinner with Mr & Mrs Horn. We had a good dinner and a very pleasant visit. There has been great changes in the old Pinney house since I was there. Rob and I came away soon after dinner and stopped to see Aunty and Henry. It was nearly night when Hatt and John came home. I read in the afternoon and evening. Monday March 28th 1881 I helped with the work some during the day. Bridget washed in the afternoon. I cut and made two colored shirts. Tuesday March 29th 1881 I cut and nearly made four colored shirts today. In the evening went over to the Universalist church to a concert which was a perfect fraud. Weather cold.